Contact Law Office of Andrew L. Bennett, P.C. To say that my family was NOT surprised when I chose to go to law school would be an understatement. From a young age my father would call me a “Philadelphia Lawyer”, because he said I like to argue about everything. Its not that I liked to argue for argument sake, rather I always wanted to be accurate in the details of the particular conversation or circumstance. Details to me,… matter. It is the fine details that many times make all the difference to a captivating story, to a particular life situation and especially to a criminal case. While cliché, “the devil is in the details”; is a statement I believe holds true so often in law. A case can turn drastically on a few small but important or critical details. An effective criminal defense attorney must put the time and effort into finding those details. While not always successful, the details need to be explored and uncovered if possible to obtain the best result possible. In addition to the importance of the details of a particular case it is also equally important to know the specifics of the law itself. The law is constantly changing, resulting in a complexity which can often be frustrating to understand. This is especially true in the area of Operating While Intoxicated where details in specific code sections of the law can influence the result in a case drastically. I was born in California on a naval base, later raised in both New York and Indiana. I attended Ball State University and continued my education attending Valparaiso University School of Law, where I clerked for the Lake County Prosecuting Attorney Office while finishing my law degree. I believe my background and the diversity of the places I have called home have enhanced my ability to see the bigger picture and fostered an empathy for every person. Prior to opening my law practice in 2016, my legal career began with me serving as a Deputy Prosecuting Attorney for Lake County, Indiana. As a Deputy Prosecutor I prosecuted all types of misdemeanor and felony offenses and was a member of the Lake County Narcotics Unit. Additionally, I also served as the Assistant Supervisor of the County Court Division. Shortly after leaving the Lake County Prosecutor's Office, I continued my legal career as a Deputy Prosecuting Attorney for Porter County, Indiana. In addition to prosecuting all types of misdemeanor and felony offenses, I also focused on vehicular fatality and serious bodily injury cases including Operating While Intoxicated Resulting in Death and Reckless Homicide cases. In my capacity as a deputy prosecuting attorney I would routinely go to crash scenes at all hours of the day or night. I was present at over 30 active fatal or extreme serious bodily injury crash scenes to assist law enforcement with obtaining search warrants and advise on legal aspects of the investigation. During my career as a Prosecuting Attorney I have tried over twenty jury trials, including cases resulting in death, and countless bench trials. In addition to my trial experience, I regularly provided training to members of law enforcement around the county in the areas of OWI law, Search & Seizure, fatal crash scene investigation, and court room testimony. I also participated in law enforcement training in the areas of NHTSA Field Sobriety Testing, the ECIR II which is the breath test instrument used to obtain a breath test results in an OWI case, Drug Recognition Expert training, trial practice skills. Additionally, I completed the Lethal Weapon: DUI Homicide Workshop presented by the U.S. Dept. of Transportation and also other trial advocacy skills workshops. This has provided me with a unique experience that I now rely upon as a defense attorney to provide great insight into and knowledge of the criminal justice system. Now, I use the experience and skills to represents client in a wide array of criminal legal matters including, OWI/DUI offenses, traffic offenses including Habitual Traffic Violator offenses, Specialized Driving Privileges and many different types of criminal cases. My training continues through continuing legal education and conferences seeking to improve my knowledge of and skill in the law. In one of my first cases as a defense attorney I was able to show the State that my client was innocent, through my own investigation which revealed the true perpetrator. My client was arrested for being in the wrong place at the wrong time. The police believed him to be unemployed and had threatened a store clerk with a knife after being confronted about begging for money from customers. In actuality, he was on his way to work. Not only was he employed and had been with the same company for more than a decade, he also had served our country in the armed forces. However, those details were overlooked by the police in their short investigation. After showing the State that it was not my client who committed the crime and giving details from a witness who knew who actually committed the offense, my client’s charges were dismissed. I experienced a true and deep sense of satisfaction in helping my client prove his innocence and having the case dismissed. 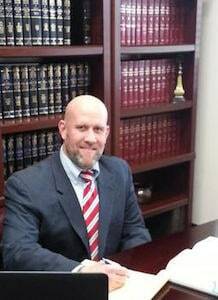 My passion to do my best, to put the hours needed into a case, is now brought to defending clients in Northwest Indiana including the counties of Lake, Porter, La Porte, St. Joseph, Newton, Jasper, Starke and Marshall in a variety of criminal cases including misdemeanors and complex felonies. I rely upon my honesty and integrity, presenting the facts in a straight forward manner. I maintain a strong rapport with my clients, other legal professionals and the bench. I would like to put my knowledge, dedication and experience to work for you, please call for a free consultation. When I first had my issue I went through the pain staking search of who to represent me. I went through a number of people before reaching Mr. Bennett. When I asked Mr. Bennett about costs, he was quick to offer a payment plan without even knowing anything about my financial situation. This was important, because my case had the potential to incur additional costs soon after hiring him... Kevin P.
Copyright © 2019, Law Office of Andrew L. Bennett, P.C.